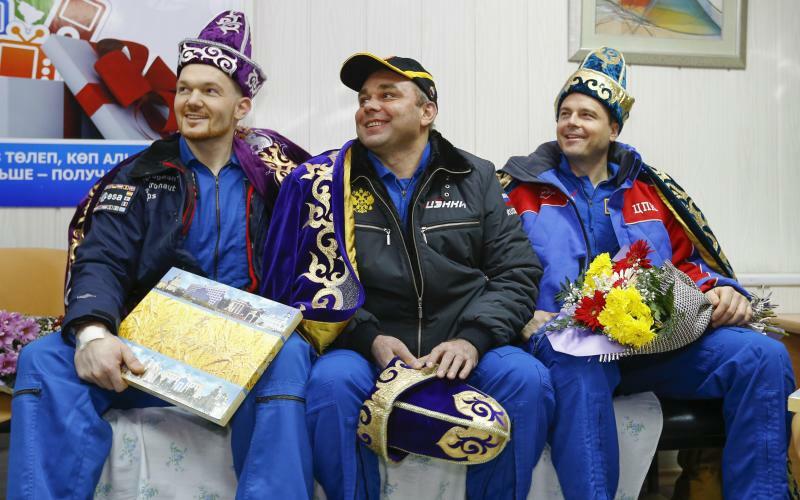 (Reuters) - A veteran Russian cosmonaut and two International Space Station crewmates, one from the United States and one from Germany, returned safely to Earth on Sunday with a parachute landing of their Soyuz capsule in Kazakhstan, ending 5-1/2 months in orbit. Maxim Suraev of the Russian space agency, who was commander of the station during the mission, climbed into the Soyuz craft with NASA astronaut Reid Wiseman and German flight engineer Alexander Gerst from the European Space Agency and departed the orbital outpost at 7:31 p.m. EST. 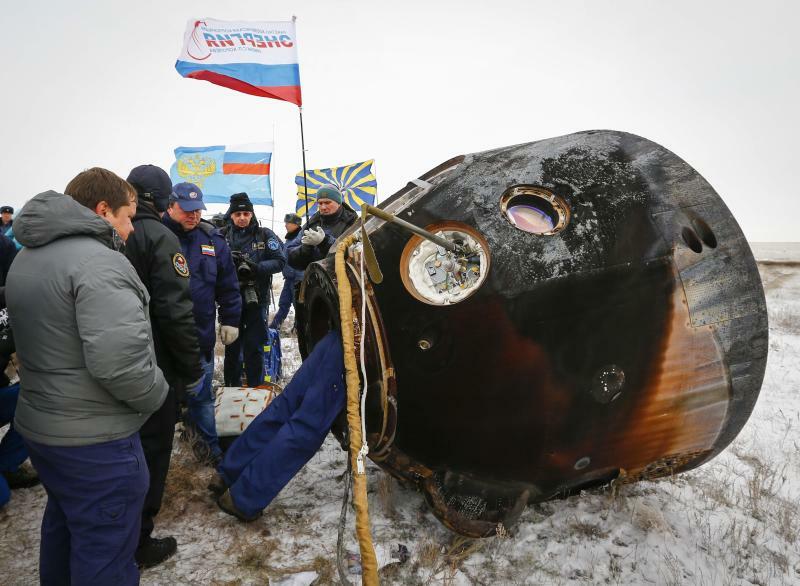 About 3-1/2 hours later, the capsule descended through cold, windy and overcast skies to touch down on the frozen steppes northeast of Arkalyk. 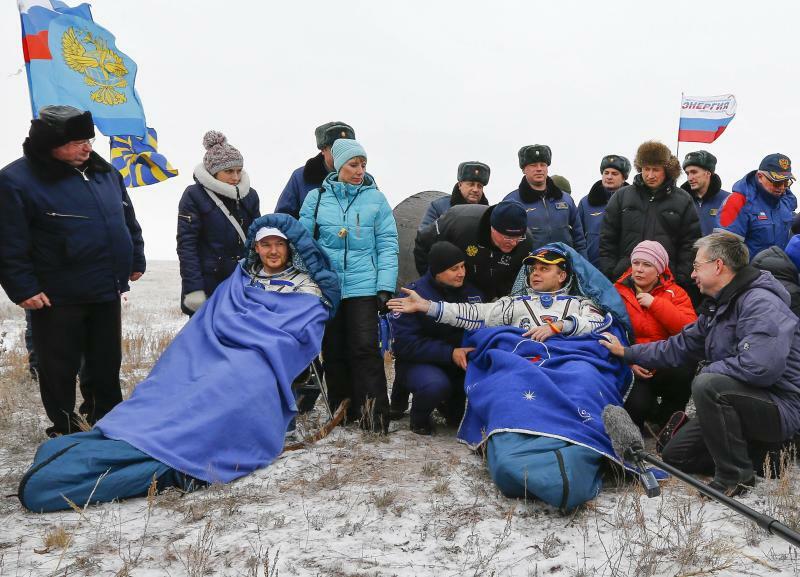 Early-morning temperatures in Kazakhstan registered just 23 degrees Fahrenheit (minus-5 degrees Celsius), mission commentator Rob Navias said on a live NASA Television broadcast of the landing. Recovery teams were standing by to help Suraev, Wiseman and Gerst out of their capsule, the same spacecraft they rode to reach the station on May 28. The crew's last few weeks in orbit were among the busiest of their mission, with the departure of a Dragon cargo capsule sent to the station by private launch company Space Exploration Technologies and the arrival of a Russian freighter. The Russian cargo ship docked with the station less than a day after an unmanned Orbital Sciences Corp. rocket carrying another supply capsule bound for the space station exploded seconds after liftoff from Virginia. "It’s been an honor and a privilege to spend 165 days up here. With that said, I’m looking forward to heading home," Wiseman said during a change-of-command ceremony carried live from the space station on NASA Television. Two other Russian cosmonauts and the newly named station commander, NASA astronaut Barry “Butch” Wilmore, remained aboard the orbital outpost, a $100-billion research laboratory that flies about 260 miles (418 km) above Earth. They will be joined on Nov. 23 by cosmonaut Anton Shkaplerov, NASA astronaut Terry Virts and Italy’s Samantha Cristoforetti, who will fly aboard another Soyuz capsule launching from the Baikonur Cosmodrome in Kazakhstan. The space station, which has been permanently staffed since Nov. 2, 2000, is owned and run by a partnership of 15 nations. "They say this is the most complex machine that humanity has ever built," Gerst said on Saturday. "Even after half a year on board, it is impossible for me to fathom how complex it is to actually operate this machine."